The Bohae Cup, sponsored by the Bohae Group, Korea, was one of the major international competitions for women go players, representing the highest level of lady go competition in the world. 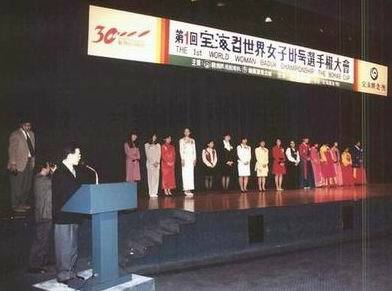 Feng Yun, as a memeber of China Weiqi Team participated in the Bohae Cup World Women's Go Championship five times from 1994 to 1998. The Chinese Women's Team, then the current superpower in the world, crowned five times in this event, taking the place of the old superpower, Japan. More recently, the Korean Women's Team became the main competitor of China. The new Sanguo story begins. In the 1st Bohae Cup, two Chinese players met in the final round. In their three games, Rui Naiwei won two to become the champion, and Feng Yun was runner-up. At the opening ceremony, the left four players are from China: Rui Naiwei, Yang Hui, Feng Yun, and Ye Jinjin. 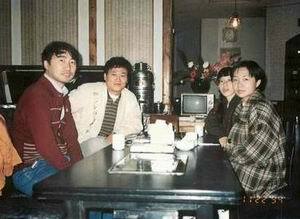 The first on the right is Feng Yun; the second on the right is Rui Naiwei. 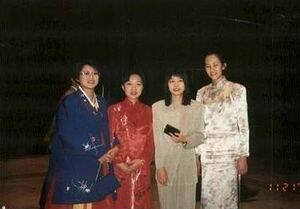 Players in their traditional costume: Huang Yan, Feng Yun, Yang Hui, and Ye Jinjin. Rui Naiwei and Feng Yun met in the finals. With friends Jiang Zhujiu, Jimmy Cha, and Rui Naiwei.